SINGAPORE may have big plans to increase its number of university places, but a high-level international panel has offered this piece of advice: Do not keep producing graduates who are carbon copies of one another. It is time for Singapore to nurture a new type of graduate with premium skills, and is innovative and entrepreneurial, urged the 12-member International Academic Advisory Panel yesterday. Presenting its views at the end of a three-day meeting in Singapore yesterday, the panel cautioned against providing more and more 'regular, academically oriented degrees'. It also warned education officials here against expanding the university sector without taking into account the needs of the students and the economy, or at the expense of quality. This had happened in some countries and resulted in high attrition rates, reduced job prospects and a general erosion of the value of a degree, it added. But the panel, which comprises both industry and university leaders, approved of the idea of a new practice-focused, applied university that has been mooted by a university review committee headed by Minister of State for Education Lawrence Wong. Speaking at a press conference yesterday, Deputy Prime Minister Tharman Shanmugaratnam, who chairs the panel, said members felt that such an institution would be different from the existing universities and serve to open up higher education choices for Singaporeans. It would also build on the strengths of polytechnic education and ensure good employment outcomes. The panel suggested the new applied university adopt broader university admission criteria that go beyond academic results. It should also take into account a student's interest and talent in an area, like design or the culinary arts, and their motivation to do well. Students could also be given more flexibility to defer entry into the university to gain work experience and to take up degrees part-time instead of full-time. The panel agreed with the university review committee's suggestion that the Singapore Institute of Technology could be the possible platform to build this new applied university. 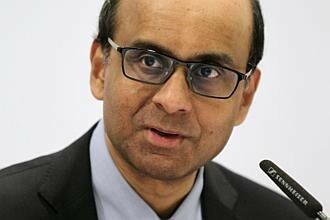 Mr Tharman said the panel also noted the university review committee had gone overseas to Europe, Hong Kong, the United States and Germany to study models of applied universities, but he stressed Singapore had the chance to create a model that is 'distinctive for Singapore'. 'We are no longer in the catch-up mode. We should keep taking lessons from the rest of the world, but we should have the confidence to develop new pathways and models,' the former education minister said. He stressed that the final model proposed must be distinctive. 'Singapore must not put all its eggs into one basket, he said, adding that diversity is the best way of preparing Singaporeans for an uncertain future. Mr Leonard Baker, managing director of Sutter Hill Ventures who had been on the panel since 1999, gave a vote of confidence to Singapore's efforts but said the universities here must move away from the tendency to base admissions on results and recognise that intelligence and talent comes in many forms. Professor Tuula Teeri, president of Aalto University in Finland, said in assessing the worth of a university education, one must look beyond employment outcomes to other gains such as adaptability and developing a 'yearning to learn'. Mr Wong said his committee will take into account the panel's views and suggestions as it fleshes out its final report by the end of the year.